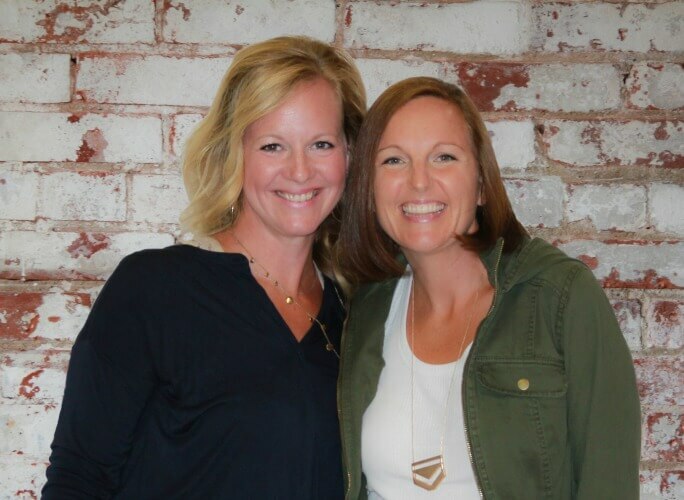 Learn more about creating effective visual schedules for kids from Meg Proctor, Occupational Therapist and owner of Learn Play Thrive! 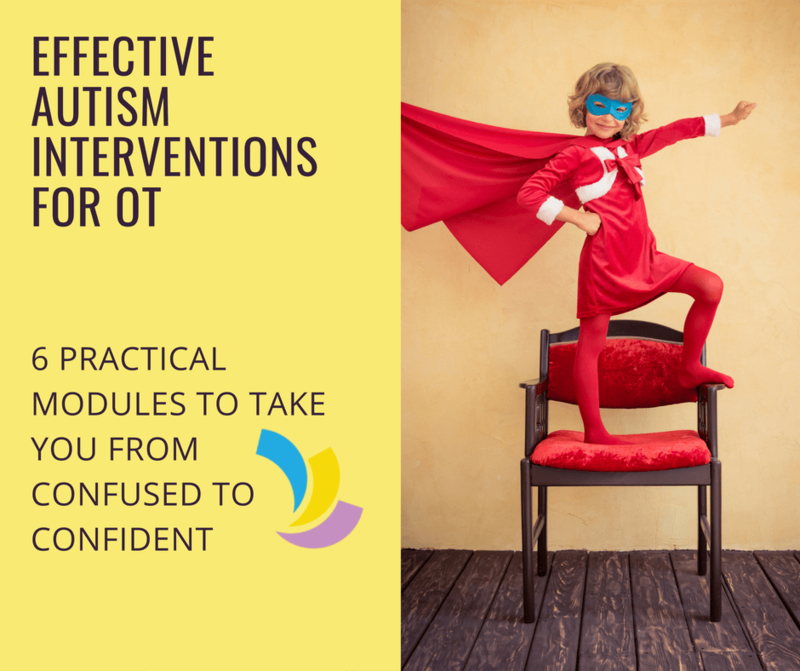 Many parents, teachers, and therapists have heard somewhere along the line that visual schedules can help their child or student with autism and other special needs. But when it comes time to make the schedule, there are so many factors that impact whether it is meaningful for the child. Have you ever made a visual schedule only to have a child completely ignore it, throw it away, or become so obsessed with it that every little change makes them more stressed? If so you’re not alone! This post and infographic outline a few concrete steps to help you make a schedule that will be meaningful for your child. Remember that no matter how you design your schedule, you will have to spend a few weeks teaching the child how to use it. After that, if you’ve designed visual schedules your child understands, you should see the transition battles start to melt away. What type of visual schedule should you use? Choosing the right type of schedule is so important. When considering which to pick, try to choose the level that your child has mastered, not what they are just starting to understand. Think of it this way: my Spanish is pretty good, but if I’m stressed or something is really important, I sure hope the instructions are in English! Similarly, if your child sort of, sometimes understands pictures, they probably will be most successful with an object schedule. For most toddlers and many older kids who are very concrete thinkers, it’s best to use actual objects rather than pictures for the schedule. Try to pick an object that the child will use wherever they are going and give them the same object each time they go to that location. For instance, each time your child needs to go to have a snack, hand them the empty sippy cup. Once they arrive at the snack table, you fill it with their drink. Or each time the child is going to the homework table, hand them a crayon, and teach them to walk over and color in one picture that you have already taped to their desk. Now they are in place and ready to work! Some kids are able to understand pictures only if they are photographs of the exact activity or location. Try taking a clear, simple photograph without a lot of distractions in it. You’ll know your child is ready to use photographs on a schedule if they can consistently identify real life objects that match to pictures of the same objects. This is where many of us start when we are making a schedule: clipart, Boardmaker pictures, or cartoons. These may be the easiest type of picture to find, but they are the hardest to understand! 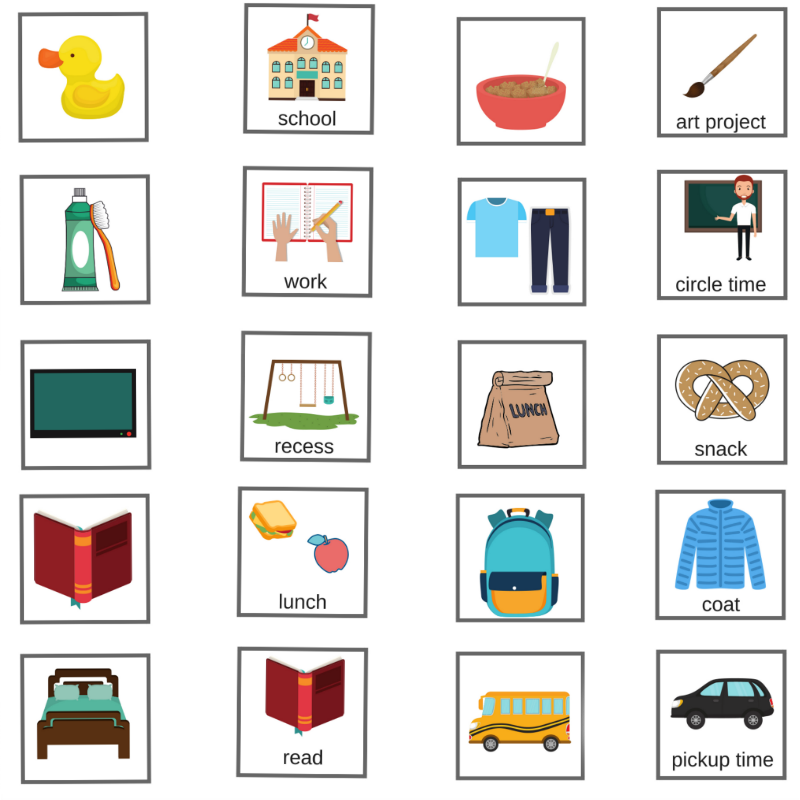 If your child consistently shows that they understand that cartoon pictures or icons represent real items, and can match items to these types of pictures, they may be able to use a symbolic picture schedule. 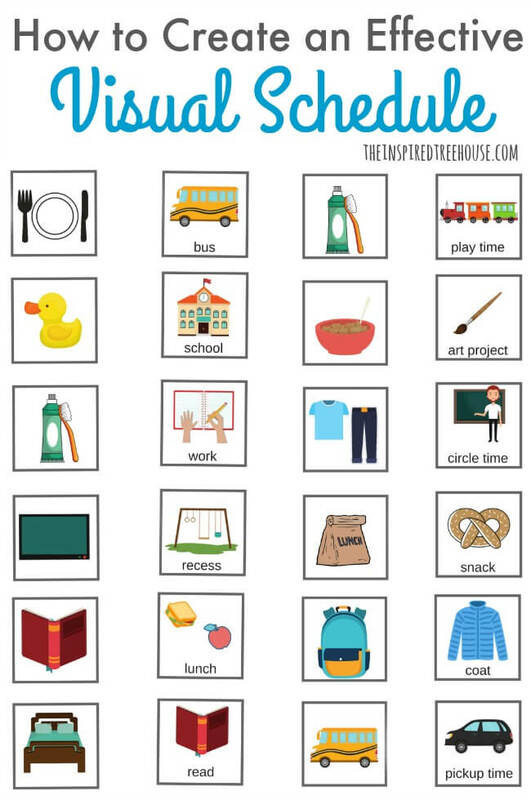 For kids who are learning to read but read slowly, guess words incorrectly, or get frustrated trying to make sense of written language, it’s best to pair the words with a picture. Learning to use a schedule is not the right time to work on reading. 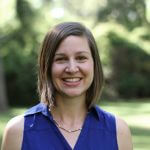 You want the schedule to be easily understood by your child. It’s best to keep reading instruction times separate from transition times. For kids who are strong readers, a written schedule may be your best bet. How Do Kids Use Visual Schedules? Many kids get distracted as the move from the schedule to the new location, or simply aren’t motivated to go the the place the schedule directs them to. For kids who get distracted, taking the object or picture with them to the location where they are transitioning may help remind them where they are going. If they get off track, you can show them the object or picture in their hands to remind them where they were heading. Using an object (like the child who colored with the crayon) or matching a picture from the schedule to a picture that is located where they are transitioning can also help with motivation. If your child loves matching pictures or wants everything to be in its place, they may benefit from this approach. Some kids don’t need to carry the picture with them but aren’t quite ready to use a checklist. For these kids, moving the picture into a “finished” pocket can be meaningful and satisfying. Many kids with written or written/picture schedules can check or mark through items on their list. It seems counter-intuitive to many of us, but a great approach is: 1) check the schedule 2) mark it off 3) go to the new location. Many of us are used to marking things off after we do them, but this method is often successful because when the child returns to the schedule for the next transition, the current transition location will be right there on the list. How long should the visual schedule be? Others can’t process the whole day at once and need a two-part schedule (maybe representing the morning and then the afternoon), or even one schedule item at a time. No matter what type of schedule you have, you can use any length! I’ve seen full day object schedules, and single-item written schedules. It all depends on what works for the child. How can you work on flexibility? I don’t know about you, but when I look at my calendar from day to day it’s never the same. I know that I can’t count on having the same routines every day. But I can count on my calendar or schedule to show me what I have to do in a clear way. Similarly, we want to teach our kids to use their schedule as a place they can rely on to tell them where to go, not a rigid memorized routine that cannot change. 3 || Eventually move towards making changes to neutral or non-preferred activities with less and less notice. That way when there’s a surprise fire drill during recess, or when swimming is canceled for the thunderstorm, your child will be ready. Always try to show your child the changes on the schedule. It’s best not to try to “sneak” changes behind their backs because that doesn’t help kids learn flexibility, rather It can make them feel stressed because the schedule has become unreliable. While your child is watching, you can pull off a picture card and put on another one, or mark through an item with a pencil or dry-erase marker. When making a new schedule, don’t get caught up in making it perfect. In fact, I always recommend that families and teachers make the first draft “quick and dirty” in case they need to tweak it. 1 || Once you’ve put tons of time into personalizing and laminating a schedule, it can be hard to want to change anything! 2 || Expect to spend some time teaching the schedule. Just because your child doesn’t understand it right away doesn’t mean you haven’t made the right choices. But if you aren’t seeing any progress after a couple of weeks, don’t be afraid to try something different. Looking for More Help With Visual Schedules? If you need more help with visual schedules, I’ll be offering free webinars on how to make a schedule. 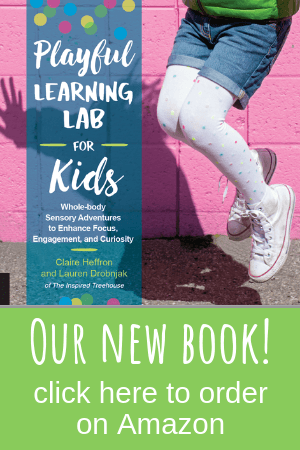 You can sign up for my mailing list at www.learnplaythrive.com or follow me on Facebook (Facebook.com/MegProctorOT) to make sure you don’t miss your chance to sign up! Learn more about why visual schedules can be helpful for kids. Check out some of our best tips for waiting and walking in line at school. These circle time tips and strategies are always great ideas to have in your back pocket! And, if you have a kiddo who can’t sit still – these circle time ideas are perfect.